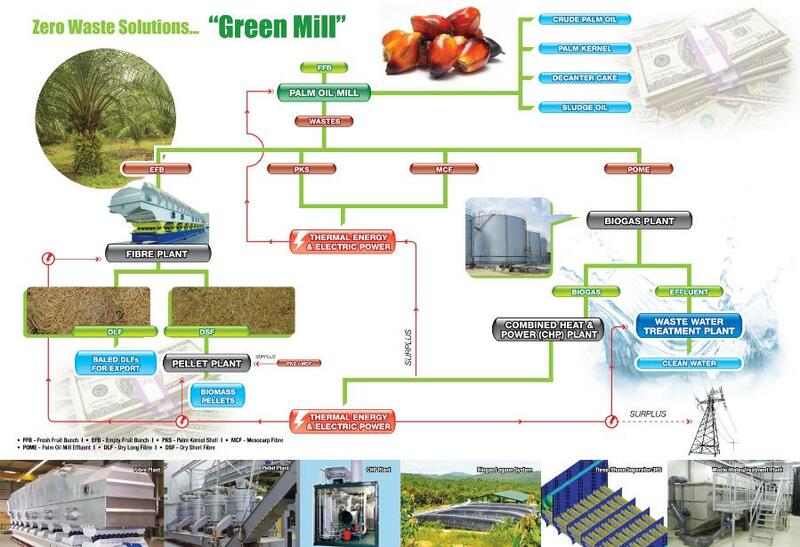 The Green Mill concept is an integration of various state of the art proven technologies to provide palm oil millers a zero waste solution with the highest return of investment in the shortest period. The Green Mill utilises ALL WASTE from the palm oil mill to generate value, including thermal and electric power for the plant usage (offsetting the use of fossil fuels such as diesel) with surplus energy optionally exported to the grid and converts solid biomass into valuable commercial products … A TRUE WASTE-TO-MONEY and WASTE-TO-ENERGY SOLUTION. The Green Mill converts all the wastes into commercial products providing the mill with tangible additional income. Biofuel pellet and/or briquette plant for production of biofuel pellets and/or briquettes from residue biomass waste such as EFB short fibres, mesocarp fibres or palm kernel shell.